While musicians gleefully move their musical talents into the tech world, they still need a way to see their work during performances or recording sessions. 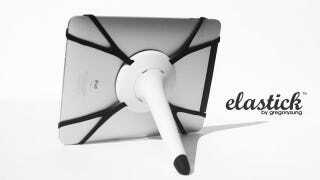 The ELASTICK solves that problem by strapping your tablet to a standard microphone stand. Easy.